“As financials markets have been marching higher the economies of the world have been taking a rather deeply opposing path. The World Economic Outlook for October 2012 published by the International Monetary Fund issued a downgraded outlook for global growth, projecting 3.3 percent in 2012 and 3.6 percent in 2013. The report cited continuing, but rather weakening recovery as advanced economies’ growth may be too low to reduce unemployment while major emerging market economies should experience growth at a reduced pace from the previous outlook. In advanced developed economies the growth outlook had been revised down to 2 percent from 1 percent while emerging market growth was revised down to 5.6 percent from 6 percent.The IMF raised its 2012 GDP forecast for the US to +2.2% from a prior 2.0% while guidance for every other major economy. We think that the report, even though it provides a direction for growth forecasts towards higher global recession risks, it might not sufficiently account for the capital flight from European Banks. The IMF correctly anticipates that balance sheets will contract severely but we think the contraction can go beyond any modelling they have done or they can conceivably work with. As the unknown -unknown factors – are increasingly becoming more numerous and complex and can violently alter the economic landscape leaving the model severely constrained. The deleveraging we think and the collapse of aggregate demand can severely press the world economies towards outlier territories and place us at a spectrum of a full world depression. There will be economies that might be able to handle such dire economic condition but nevertheless the Kondratieff cycle of deep winter (depression) is and will continue to be upon us for a long time. The Kondratieff cycle includes the historical incorporation of geopolitical cataclysmic changes and global conflict as in the process of renewal Capitalism destroys the old and creates the new, emerging ever more powerful and offering the world the new launching pad for revolutionary growth and ideas. 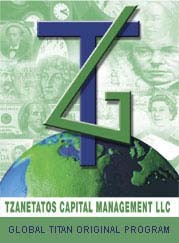 Global Titan perfomance updates are carried by major institutional world hedge fund databases. Bloomberg updates Global Titan (Symbol: GLTITAN) on their world wide terminals.